We’re familiar with the war between birds and pigs, but did you know an equally important battle is currently waging between pigs and dragons? That’s the case in Pig & Dragon, CookApps match-three Facebook game which currently has over 843,000 monthly active users and climbing, according to our app tracking platform AppData. The game sees players swapping pieces of fruit to feed dragons, with a variety of goals to complete along the way. In each level of Pig & Dragon, players clear fruit from the board, with matches of four or more fruit adding “power” to surrounding fruit pieces. That is, surrounding fruit may be boosted with a “+2” or “+3” marker, making that piece worth multiple points when cleared. Furthermore, if players make matches with specific fruits, they’ll feed their dragon helper on the side of the screen. When the dragon is full, it will shoot additional power boosts to random pieces of fruit on the board, helping players earn big scores in the process. Players unlock additional dragons at certain level milestones, and can upgrade each dragon by collecting more stars on their matching levels. Stars are earned in relation to the number of points collected on each match-three stage, so players are encouraged to play them repeatedly to collect all of the available stars. Gamers can also purchase power-ups while playing, like score multipliers and additional moves for the game’s move-limited levels. These are purchased with coins, which are earned for free while playing the game, or can be purchased with real money. 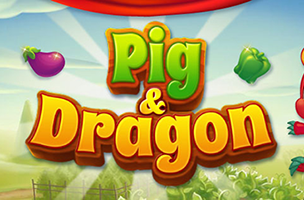 Pig & Dragon is available to play for free on Facebook. Check back soon to follow the game on AppData, our tracking platform for mobile and social apps and developers.